nameSherry: ONE CHAMPIONSHIP ATHLETES TO LAUNCH BAD LAB’S BRAND PAGE IN WATSONS ONLINE STORE! 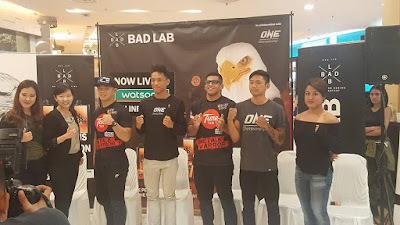 ONE CHAMPIONSHIP ATHLETES TO LAUNCH BAD LAB’S BRAND PAGE IN WATSONS ONLINE STORE! BAD LAB, the complete personal care range man-gineered for the unconventional man are pleased to announce the launch of Bad Lab’s exclusive Brand Page on Watsons Online Store. In attendance are brothers Gianni and Keanu Subba, former world title challengers Ev “E.T” Ting and Agilan “Alligator” Thani, as well as Malaysian warrior belle Ann “Athena” Osman. Members of the public taking part in the “Face-off” challenge against ONE Championship Athletes. You can refer to the video above, where winner wins a pair of ONE Championship tickets for this Friday night. As the official personal care brand sponsor of ONE Championship for the 2nd year in a row, and in conjunction with ONE Championship’s coming Fight in Stadium Negara (18th Aug 2017), ONE : QUEST FOR GREATNESS, BAD LAB announced the availability of BAD LAB products via Watson’s online store. On this special occasion BAD LAB and Watsons together with ONE Championship is holding a “Meet the Fans” event held on August 14 from 2 to 4 pm, at the Watson’s Store in Sunway Pyramid, Bandar Sunway, to gives fans a unique opportunity to show their support for their local athletes and have some fun experiencing BAD LAB’s products alongside top-ranked ONE Championship athletes, such as the popular Malaysian female athlete Ann Osman, brothers Gianni and Keanu Subba, former world title challengers Ev “E.T” Ting and Agilan “Alligator” Thani. 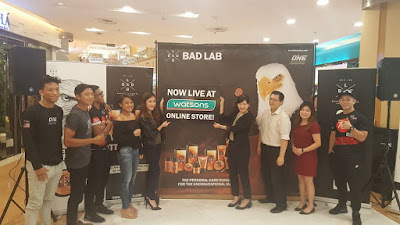 Following the announcement of BAD LAB’s availability on Watsons Online Store, BAD LAB in collaboration with Watsons will offer as much as 20% Price Off and Freebies to consumers whom purchases at Watsons Online Store, until 31st August.